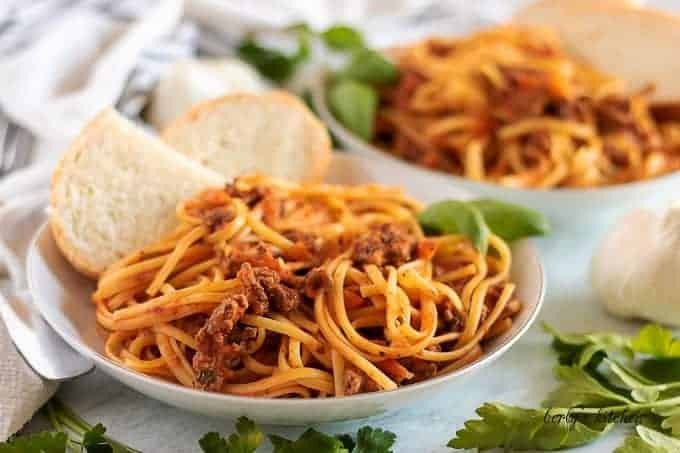 A hearty, rich beef bolognese sauce tossed with linguine. 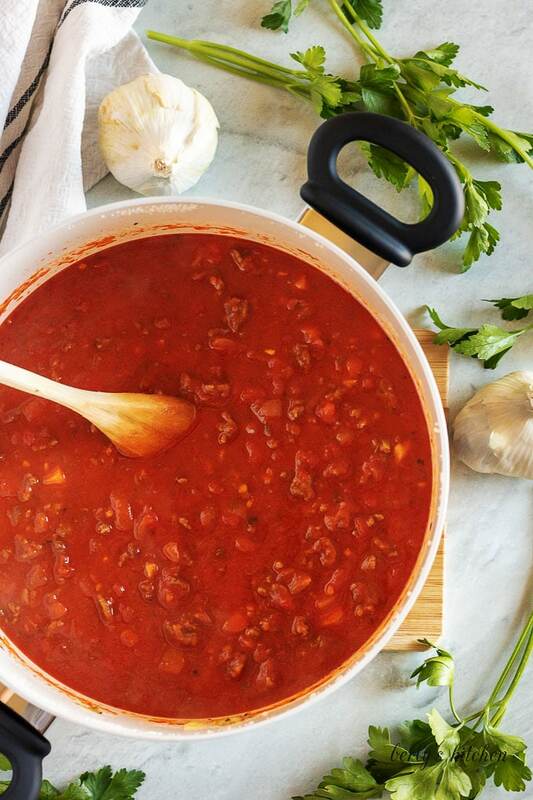 Nothing beats a homemade pasta sauce made in your own kitchen and our recipe is sure to satisfy! 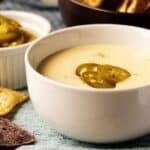 I can’t tell you how excited I am to share Kim’s recipe! She worked hard on our beef bolognese and I can tell you it was super tasty. But, before we get to the recipe, I want to talk about something near and dear to me. Let’s take a moment to talk about, “authenticity,” in cooking. Specifically, here in the States. Man, people get so worked up over what’s authentic. “That’s not authentic. My grandma made it this way, etc.” Well, I have a news flash for you. Unless you’re super wealthy and can afford to import all of your cooking ingredients and utensils, then I’m pretty sure most of what you make isn’t authentic. Here’s why, in the U.S. we have food processing guidelines that differ from Canada’s, Mexico’s, or even Italy’s guidelines. Point is, it’s almost impossible to create an authentic meal when you don’t have access to the original ingredients and items used in making the dish. Take for example, my homemade pasta sauces, which when cooked, have more orange hues, than red. Why is that? The reason is that I don’t use canned ingredients with dyes. I use local tomatoes, garlic, and onions. Tomatoes, that are local to me, when heated and reduced, end up looking orange. Not the normal, bright red color associated with most Americanized pasta sauces. So, while I strive to use natural, “authentic,” ingredients, the end result is still slightly different. Moreover, it will never be considered authentic to person who lives in, let’s say, Rome. For our final example, I’ll tell you about Hungarian bean soup. If you’ve never had it, then you’re in for a treat. I grew up eating it. Pinto beans, slow cooked with kielbasa sausage, and sauerkraut. As authentic as it gets. That’s right…pinto beans (Peruvian), sauerkraut (Austrian, German, etc. ), and kielbasa sausage (Polish, Ukrainian) an authentic, traditional Hungarian soup…? Did you catch the sarcasm there? Truth is, until I grew up, I had no reason to think otherwise. See how silly that sounds? So, when you prepare a meal and someone, “pops,” off about it being unauthentic, just laugh. Because, truth is, at least here in the States, being truly authentic is a rarity. I’ve found, most of the time, the people making those statements are simply bitter, distasteful human beings. Is it any coincidence their cooking skills follow suit? It seems almost funny that they’re only capable of preparing bitter, tasteless food. What they fail to see is that it’s not the tomatoes your grandma used that made the dish, “authentic.” It was the passion she put into the dish. Love was the most important, “real,” ingredient she used. Something we should all think about before being so critical. I know it may seem strange to add the garlic just before tossing in the liquid ingredients. But, if you put it in at the beginning it may stick and burn. When garlic burns, it becomes bitter and that can ruin your sauce. It’s always better to under cook it than to overcook it. If you’re good with multi-tasking, then feel free to boil your pasta while the sauce simmers. Doing so, will result in a faster cook time overall. Basically, you can go from stove to table in less than an hour. 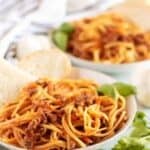 In case you were wondering, “Which wine should I pair with beef bolognese?” For our recipe, I recommend either a red or a blush. Since this is a beef dish, a red wine would be the obvious choice. However, some people, like myself, find reds to be overly dry. With the addition of heavy cream to the pasta sauce, you can get away with serving a blush (red and wine mix). 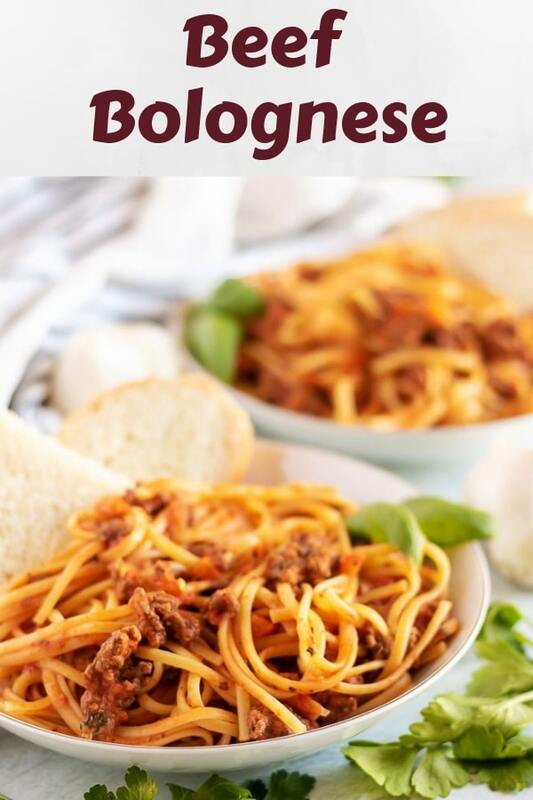 If you enjoyed our homemade beef bolognese recipe, please leave us a comment and rate the recipe card. You can also find us on Facebook, Pinterest, Twitter, and Instagram by searching for Berly’s Kitchen! Heat a large stockpot over low-medium heat. 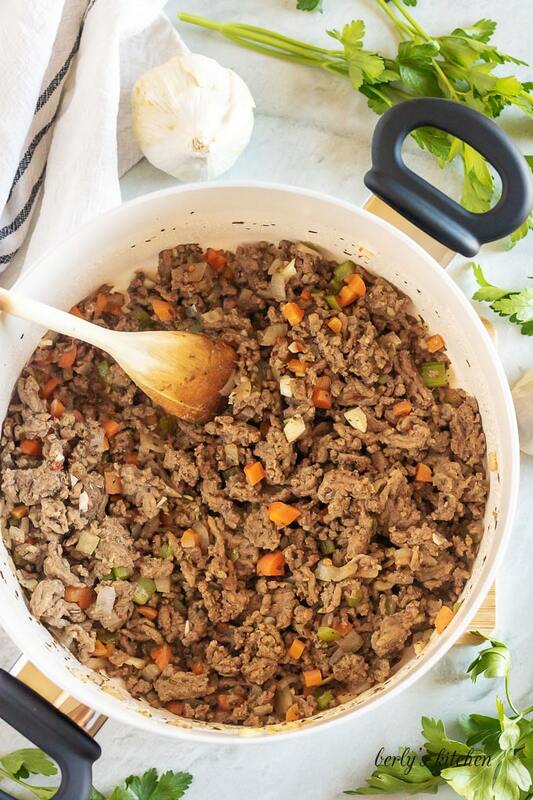 Add olive oil, onions, carrots, celery, and ground beef. Use a wooden spoon or spatula to break up the beef. Add the oregano, nutmeg, salt, and pepper. Just before the beef browns completely, add the garlic. Continue to cook until the vegetables soften and beef is browned. After the beef is cooked through (drain the grease if desired), pour in the beef broth or wine. Use the wooden spoon to scrape any bits off the bottom of the pan. Add the crushed tomatoes and tomato paste. Stir to combine. Cover and let simmer for 10 minutes. After 10 minutes, remove the lid and add the basil and heavy cream. Stir to combine, and cook an additional 10-15 minutes. Serve over linguine, fettuccine, spaghetti, or other long pasta. Top with freshly grated Parmesan cheese if desired. 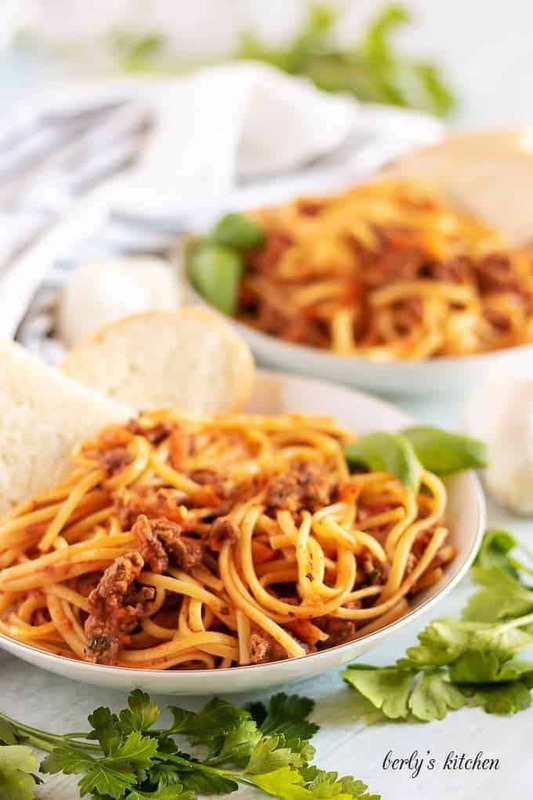 The calories listed are an approximation based on the ingredients and a serving size of one (1) cup of beef bolognese. Furthermore, the count does NOT include the pasta noodles and bread shown in the photos. Actual calories will vary.